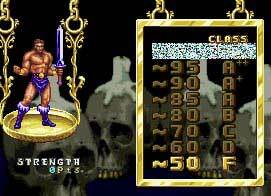 Occasionally letters trickle in that explain the unexplained and unique features of Golden Axe. For a lack of a better place, those letters will now find their way here. The museum of the odd. The circus of confusion. The repository of the great, wide world of unknown Golden Axe facts. Send your comments in here. 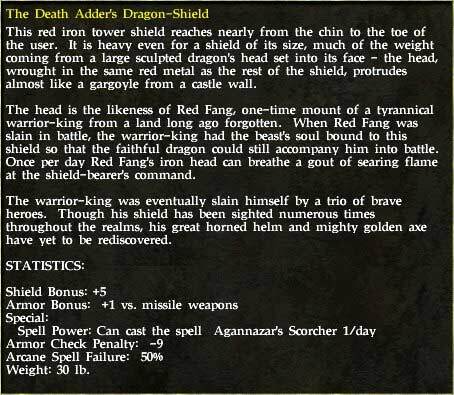 Lexor has found an interesting connection betwen Golden Axe and Icewind Dale II -- The Death Adder's Dragon Shield! For now i can tell you that the GA:RDA has all the elements of the series, like the thieves stealing in the night and dropping potions, the magics, the minions (longmoans, skeletons, undead) etc. You can also choose your path during the game, in a total of 29 stages (Some are substages). During the demo, Tyris use her magic and masses of fire are moving from left to right. Watch closely as one of the masses fall off the ledge! In the caves, when you free the first prisoner from a cell, he escapes to the right. But that's where Death Adder's minions are! He should have run to the left! In Turtle Village 1, when the first villagers escape left, I ran after them (actually with them) and they fall off the ledge into oblivion! I think the scrolling work differently in the PC, I'm not sure this work on other systems. Why spend time hard at work? Wouldn't it be much more fun to be gambling than doing your meaningless job? Sure it would. Download my very own brand of Slot Machine (now in Version 1.01) and let the hours just flow away. The file is 2.9 mb in size, so new puny modems allowed! I would like to contribute to this site on two items. 1) Little known fact: The Golden Axe II (GEN) cartridge's sticker is easily eaten-up by a dark fungus. It starts on a corner and then eats up about half of its entire surface in approximately 10 years, revealing the black plastic underneath it, with glue remnants. I don't know if extreme humidity is needed for this "bug" (he-he) but it happened to mine after I submerged it under water 10 years ago out of boredom and frustration. You see, I asked for GA for Christmas that year, but they got me the second part. Potions were books, goblins were wizards... extremely disappointing for a kid. Anyway, I want to warn owners the world over about this side effect of total submersion of the cartridge. Writing this I recall a much earlier disappointment... I got Zelda II instead of Zelda many years before that!! What is the deal with my parents?! This is how Death Adder's followers are formed. 2) I speak on behalf of Supporting Cast Alex. For his best interest, accuracy in his bio and interesting facts. Golden Axians die in 3 hits, it is a fact. The DA minion hit him two times... but he was saved just before the third one. The third one would have sent him to the ground and made him vanish. How do we know this? Bad people turn to clay when they die, good people vanish. Alex is one of the good guys. He is a Royal Guard... probably the only one left alive. He is definitely not a peasant. And his deep knowledge of current politics make him more likely a royal guard (being close to all the happenings) than a soldier. The CPU controlled player saves him from the third hit. And in gratefulness and joy he explains himself. Notice he is already severely wounded, in crutches even for crying out loud. That means his life bars have been depleted. He is on his last stand and that third blow would have killed him NO DOUBT. He tells us of the problem, then passes out from his wounds since he already delivered the message to us. He has succeeded in his mission, now he must rest and heal. With the adrenaline gone, he plummets to our feet. Very alive, which is why he neither vanishes or turns into clay. Also why we don't mourn him or show grief. Because he is ALIVE! We could aid him, but we have much more important things to do. Save the royal family. We already knew something was amiss, for we were already on our fully equipped journey. Wielding our weapons and with ready magic jars. Don't tell me this isn't already moving toward the source of the problem. Weapons out and all! So you see, Alex did not die. You know DA killed relatives of each character. Why would they be traveling together, a dwarf, an Amazon and a warrior. Weapons readied and magic at hand? They all have a common hatred for DA, and are ALREADY on their way to avenge their relatives. It couldn't be more clear. Alex just gives them a direction in which to continue. Someone better call a doctor for our good friend Alex. He doesn't look so good. Here is the story behind Hokari Sweat. There is a Gatorade-like drink sold in Japan called "Pokari Sweat." 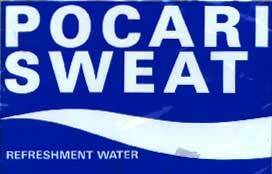 So, "Hokari Sweat" seems to be a pun on this drink. 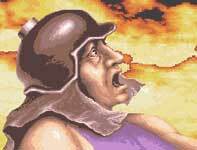 What are the implications for the Golden Axe world? A strange thing happened recently at a friends place. There I was watching the movie 'First Blood' with Stalone.. and all of a sudden, recognizable sounds drew in memories of the great Golden Axe arcade game, notably the death cry of the man falling from the chopper, and a few others. I would almost bet that some of these sound bites were actualy taken from the movie and put in the game, or vice verca.. perhaps you would like to watch the movie yourself and check it out. I never got the rating past "best in the galaxy" either. I think maybe if you destroyed absolutely everything there was to destroy (all the enemies, statues of DA, etc) then maybe you could get the "best in the universe". Probably when enemies commit suicide by walking off cliffs and stuff, that doesn't get added to your score. But maybe if you actually dealt the fatal blow to every enemy, then you'd be "best in the universe". So, what is the secret to Best in the Universe? Does anyone truly know? I'm not 100% sure, but I believe these four steps are what is needed to achieve Best of the Universe in Golden Axe: Revenge of Death Adder. 1) You must maximize your number of points per enemy. Use the moves that do the most points relative to their damage. 2) You must not use magic at ALL. 3) you must not let any enemies fall off pits. 4) You may not die. Poor Sternblade can't even get a passing grade, let alone a "Best in the Universe" rating. 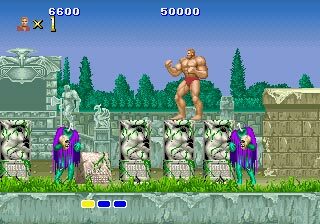 The first is one thing in arcade version of Altered Beast: do you see anything you know? Something like a familiar tomb? 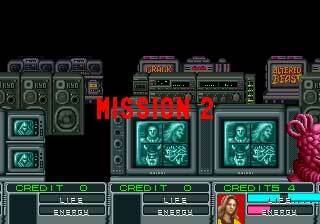 Second, is the apparition of Gilius and others in the arcade version of Alien Storm. 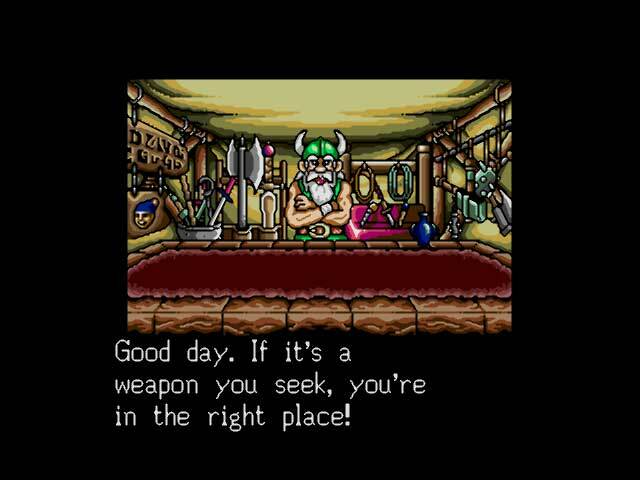 I found another appearance of Gilius in a Sega Genesis' game: it's "Shining in the Darkness", a role game where Gilius appears as blacksmith: we can see him with his axe and the little face of a blue thief. 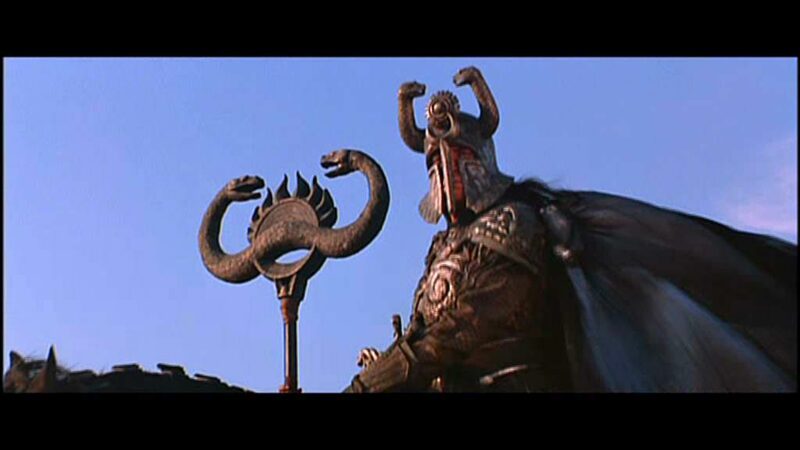 The last is one image that I took from the DVD Conan the Barbarian: I took an image of Thulsa Doom and I transformed it into Death Adder: the inspiration at this movie for the Sega's game is evident. Here there are two different version: the original Thulsa Doom and the transformation into Death Adder.